Commenting on the Group’s results, F&NHB Chairman Tengku Syed Badarudin Jamalullail said that the results were driven by strong fundamentals and clear focus on long-term growth, which exemplified F&NHB’s resilience amid various head winds. F&B Thailand sustained its growth and market leadership during the year under review through successful introduction of new products and packaging formats, supported by effective branding and consumer trade campaigns, despite a difficult domestic market environment and encountering the loss of UHT milk revenue caused by inventory shortage resulting from a co-manufacturer’s plant that was damaged by fire in November 2017. Revenue for F&B Thailand grew 2.2 per cent in local currency terms but gained marginally by 0.3 per cent to RM1.787 billion from the corresponding period in 2017 due to the strengthening of the Ringgit against Thai Baht. F&B Thailand’s operating profit for the financial year ended 30 September 2018 rose 13.1 per cent to RM258.0 million compared to the same period last year on the back of higher export revenue, favourable input costs and lower overheads. The gains were partly offset by higher A&P spend for new product introductions and brand building activities. “Despite the challenging first half of 2018, we remained focused on capacity and capability building, cost optimisation and extraction of synergies, leveraging consumer-focused innovations to deliver new and unique product offerings, and expanding the reach of our export business. This has allowed us to pull together a healthy set of results and delivery of our financial objectives within volatile domestic markets and commodity prices during the year.” said F&NHB Chief Executive Officer, Lim Yew Hoe. During the year under review, F&B Malaysia introduced a broader portfolio of healthier choice products in support of the Government’s call for lower sugar content in beverages. 100PLUS Reduced Sugar was introduced as the lowest sugar carbonated isotonic drink in the industry and the entire 100PLUS range has been reformulated and now carries the Healthier Choice logo. 100PLUS ACTIVE in powder sachets was also introduced to meet increasing consumer demand for greater convenience and flexibility, particularly for people on the go. The new Cold-Aseptic Filling Polyethylene Terephthalate (PET) line at the Shah Alam plant that uses 40 per cent less PET resin packaging has commenced production. 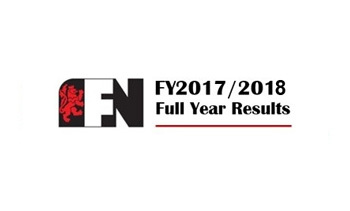 This line is currently producing 100PLUS ACTIVE, OYOSHI and F&N SEASONS range of products and will spearhead F&NHB’s expansion into new product offerings. In line with the Group’s performance, the Board is recommending a final single tier dividend of 30.5 sen per share (2017: 30.5 sen per share) for approval by shareholders at the forthcoming Annual General Meeting. If approved by shareholders, the total dividend for the year would amount to 57.5 sen per share (2017: 57.5 sen per share).